Depending on who you listen to, “Hell in a Cell” was either the brain child of Jim Cornette, inspired by the cage matches in Memphis, or came from Shawn Michaels, who took inspiration from the classic “Last Battle of Atlanta” war between “Mad Dog” Buzz Sawyer and “Wild Fire” Tommy Rich. 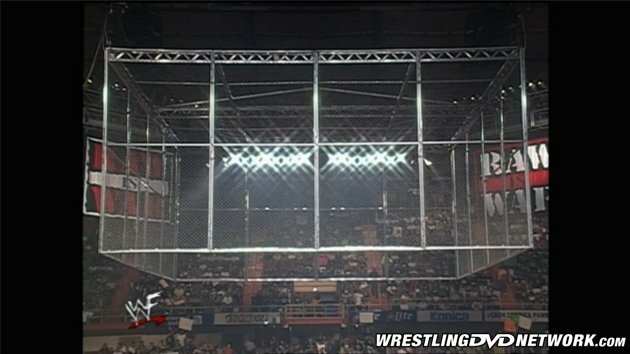 It was Vince McMahon, however, who expanded the concept from a simple steel cage with a roof to the massive monstrosity known as “Hell in a Cell”, a structure that has, on 33 different occasions, been the site of some of pro wrestling’s most barbaric and brutal moments. With Hell in a Cell 2016 only a couple of weeks away, and the latest combatants preparing for hell (including Charlotte and Sasha Banks), Throwback Thursday reloads to looks back at 8 of the greatest “Hell in a Cell” matches, just like we did a year ago, thanks to the WWE Network. Six days before the 1998 King of the Ring, where Stone Cold Steve Austin would defend the WWF Championship against Kane, and The Undertaker was set to wage an unholy war against Mankind in only the second PPV HIAC, the four men clashed in this epic tag team brawl on Monday Night RAW. The first of only two HIAC matches on free TV (the other, a Kane/Mankind showdown, would take place 10 weeks later), this bloody war perfectly set the stage for the two main events at the PPV and delivered a classic Monday Night RAW main event that, with the wonders of the Network, now includes footage (“Extra Attitude”) that did not air at the time on USA Network! This instant classic was a return to form for “Hell in a Cell” after the dud that was the Undertaker/Boss Man HIAC at WrestleMania XV. In what was only the fourth PPV HIAC, Triple H and Cactus Jack put on the most compelling and complete HIAC, in terms of psychology, since the debut match. Even with the cliches (“broken in half”, spot through the roof, etc.) this match remains one of the greatest, most talked about, and most watched HIAC matches ever. In some ways this HIAC, as well as the angle, epitomize the “Attitude Era” with the wild brawling, the blood, the props, the stunts, and the over the top violence. 16 years later the “Armageddon Hell in Cell” remains a frantic, unpredictable masterpiece that continues to shock and entertain. The only 6-man variation was a hard act to follow and was, as a result, the last HIAC for 17 months. Rikishi’s bump from the top of the cell quickly became one of the defining moments of the entire “Attitude Era”, on par with the beer truck and Mick Foley sailing off the same cell. The match also featured an early preview of two of WrestleMania X-Seven‘s marquee matches, Undertaker/Triple H and Stone Cold/Rock. Not much needs to be said about this classic battle. To call it a war simply doesn’t do it justice. In 2002 Brock Lesnar was the “next big thing” in WWE. Having gone through Rob Van Dam, Ric Flair, and Hulk Hogan, Lesnar was looking to conquer the legacy of Undertaker and “Hell in a Cell”, the match Undertaker had made famous. At this time in WWE HIAC wasn’t yet the “Devil’s Playground”, it was hell itself; the most violent, barbaric match in all of WWE, guaranteed to provide the kind of blood and guts action old school fans had cut their teeth on. This match fit the bill in spades. This was only the second HIAC to be fought entirely within the confines of the cell, after the aforementioned Undertaker/Boss Man match. Featuring incredible violence, hellacious amounts of blood, and some of the best psychology in match history, this HIAC remains as much a classic as the debut match itself. After participating in arguably the greatest WrestleMania main event of all-time (3:58:25) and a rematch for the ages (2:02:05) at Backlash 2004, Triple H and Shawn Michaels set out to end their nearly 2 year war in the longest HIAC to date. Though the match felt like a ‘greatest hits’ collection of the best spots of the long-running feud, it delivered an old school story of hate and revenge, adding the kind of finality few feuds get in WWE today. While it hasn’t aged as well as other HIAC matches have, it’s a classic war whose story never gets old or goes out of style. The 15th HIAC marked a turning point in not just HIAC itself but all of WWE. This was, for all intents and purposes, the last of the old school HIAC matches. Batista and Undertaker had been at war over the World Heavyweight Championship since WrestleMania 23 where The Undertaker won the title and extended “The Streak” at the “Animal’s” expense. This match was to have settled the feud once and for all but actually served as the unofficial start of Edge’s dominance of the World Heavyweight title and rise to Hall of Fame status. This was the last HIAC to feature dramatic use of blood and was the last World title HIAC for almost 2 years. The angle leading up to the 28th HIAC was quintessential WWE, blending reality and fiction to create a believable and compelling story. This marked the culmination of a WWE title saga that started in August at SummerSlam 2013 when Randy Orton and Triple H stole the WWE title from Daniel Bryan only moments after Bryan had dethroned John Cena to win the first WWE title of his career. After a fast count at Night of Champions 2013 the title was held up until Battleground 2013 where a schmoz finish set the stage for this match, the only HIAC for a vacant title. This match wasn’t about brutality so much as old fashioned psychology, drama, and tension that culminated in a shocking finish that had fans around the world buzzing. Seth Rollins and Dean Ambrose had been at war since June 2, 2014 when Rollins joined forces with The Authority, turning on his brothers in The Shield (2:05:43). Though the program had suffered from some over-the-top angles along the way, including a hot dog cart and Ambrose being Curb Stomped into a stack of cinder blocks and coming out unscathed, the intensity of the feud was strong enough to overcome it. And while this was a feud better suited for a more permissive era, these two pushed the boundaries and presented an old school HIAC match with as many thrills and spills as any of its predecessors. Disappointing finish aside, this was an instant classic that helped cement Seth Rollins as the future of WWE. As we look forward to what this year’s event will bring, and what new horrors will be unleashed, we see in these eight matches that ‘past’ isn’t always necessarily ‘best’. That given the right story and the right moment any HIAC match, any time, could be the next great war. That’s all for this week’s entry to TBT on WDN – thanks for reading! Hold up, you aren’t already subscribed to the WWE Network? What are you waiting for? Sign up, go relive all of these infamous “Hell in a Cell” classics, and let us know what you think in the comments below. Watch every Hell in a Cell in history, the Hell in Cell 2016 PPV, and 6,000 more hours of content only on WWE Network. Your first month is FREE! Click here to subscribe to the WWE Network. some reason i just find that hbk vs hhh cell match so damn boring. Kinda shocked we have yet to have another 6 man cell. Great HIAC matches pick just like last year, Brock. Regarding the RAW Tornado match in 1998: the “Attitude Extra”-footage, is that the same footage that is on the HIAC compilation DVD set, with Austin and Kane on top and Paul Bearer locked inside the cell? I just checked the DVD and no, the DVD does not have the “Attitude Extra” footage. The DVD version of the match ends with the end of RAW. The “Extra Attitude” footage includes several minutes of extra action plus the actual finish. Thanks for reading, Ruthless.Attitude.Eras.4Life, and taking the time to leave a comment!